Or Bocconcini if that’s what you discover the kid in the cheese department gave you right before you assemble this. At least it was buffalo. This was meant to be a first course but I doubled it and served as an appetizer. It was a bit of a mess to eat and I’m not entirely happy with the size/shape (I’d love for them to be more bite-sized) but they were crunchy and garlicky and delicious. I used small loaves of ciabatta, halved horizontally (as if to make a sandwich) then the halves cut in half. These get brushed with olive oil then toasted in a 400-degree oven. When they come out you are supposed to brush them with a little water and I was highly skeptical of this directive but I had my handy spray bottle there so I misted them before rubbing with a halved garlic clove. Then on goes the cheese followed by a topping of arugula that’s been tossed with some olive oil and finished with some lemon zest. I lost track of how many times they told me to drizzle with olive oil so missed a drizzle or two. Don’t go crazy with the arugula; even though I doubled the recipe the small container (5 oz.) of baby arugula was ridiculously too much for this. You will only need about 2 cups. The arugula and lemon added a wonderful pepppery, fresh note. It would indeed be lovely as a first course or you could go even bigger and make it a sandwich. My daughter and I ate the leftovers, cold, the next day. 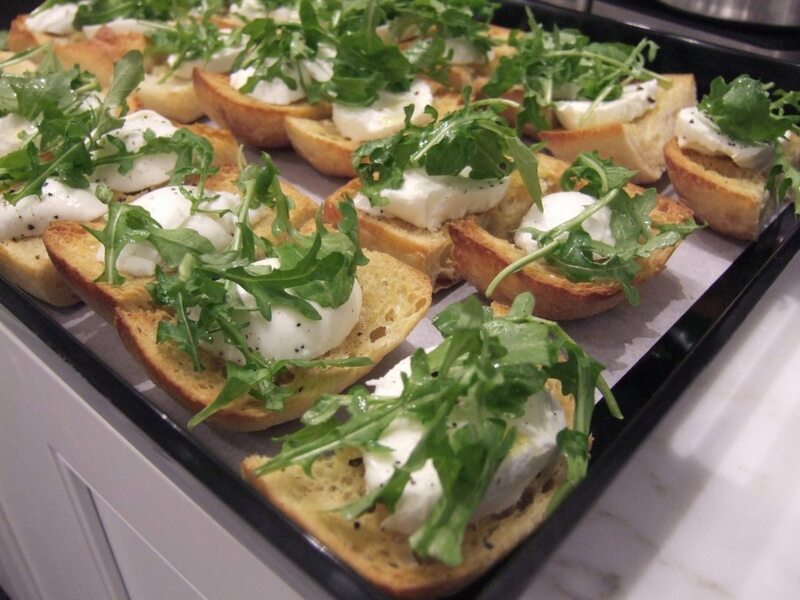 They had lost most of their crunch and the arugula was not as perky as the night before but it was still cheese on garlic bread. 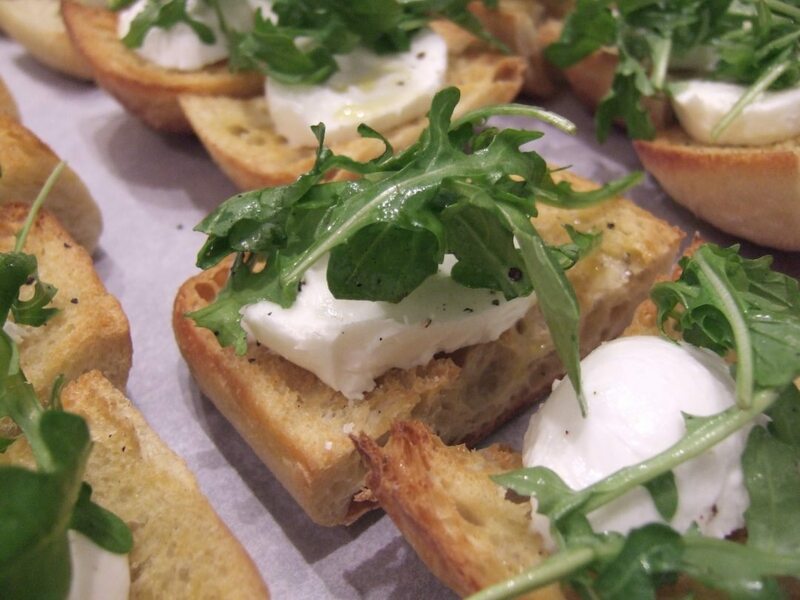 Toasted Bread with Burrata (or Bocconcini) is from Bon Appetit (May 2010) and can be found right here on Epicuious.